This entry was posted in Monthly Event and tagged Ekisvi Sharif on Sep 30, 2018 by Syed Bashir Ahmed Niazi. Urs of Hazrat Bilal Habashi (R.A) 1440 Hijri -2018. The Urs of Hazrat Bilal Habashi (Radi Allahu anhu) in Syria is on 20th Muharram 1440 Hijri. This is approx Monday 1st October 2018 (Depending on the Lunar date of your country). This entry was posted in Annual Event, URS Sharif on Sep 27, 2018 by Syed Bashir Ahmed Niazi. Approx: Tuesday 25th September 2018 (Depending on Lunar date of your country). Hzrt Khwaja Mumshad (R.A) ,Their title was Karimud Deen Mun’im. Dinwar is a city between the cities of Hamdaan and Baghdad. He hails from Dinwar. He is known by the title Karimud Deen Mun’im because of his generosity. He was very wealthy. He attended to the requirements of a great number of needy and poor. Afterwards he adopted poverty and went to Makkah Mukarramah. There is some uncertainty in whether Khwaja Mumshad Dinwari and Khwaja Ilw Dinwariare the same person or two different persons. Since the date of death and other anecdotes attached to both names are identical, it appears that both names refer to the same person. However, on account of the Silsilah attached to the names being different, some claim that these two names refer to different persons. Khwajah Ilw Dinwari is enumerated in the Chishty Silsilah while Khwajah Mumshad Dinwari is said to belong to the Suharwardi Silsilah. However, the first view is more reliable. He was a perpetual faster. It is said that even during infancy he would sometimes abstain from drinking his mother’s milk. He is therefore called a born Wali . Until I had left behind all my knowledge and conditions (spiritual states), I did not go into the company of a buzrug. After I had left my Uloom and Haalaat(spiritual states), I entered into the service of a buzrug and waited in expectation of the barakaat (spiritual blessings and benefits) which are obtainable from hisziyaarat (looking at him) and his discourse. When a man goes with his own spiritual states to a buzrug, then he is deprived of the fuyoodh (spiritual benefits) of that buzrug because of engrossment in his own knowledge. If you accumulate the wisdom of former and later times and if you claim to possess the spiritual states of the Auliya, you will not reach the rank of theAarifeen as long as your baatin (spiritual heart) is not at peace with Allah and as long as you lack complete reliance on what has been predestined for you. Khwaja Abu Muhammad, Khwaja Abu Ahmad Bagdaadi, Khwaja Abu Ishaq and KhwajaIsti’dad Ahmad Dinwari are his khulafaa. Among them Khwaja Abu Ishaq is a member of our Shajarah. 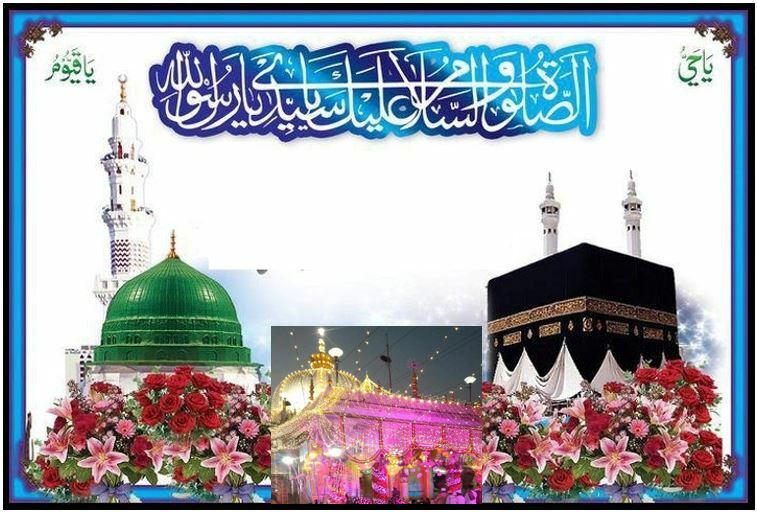 This entry was posted in Annual Event, Chishty Wali-Allah (Saints), URS Sharif on Sep 22, 2018 by Syed Bashir Ahmed Niazi. Gyarmee Sharif Muharram 1430 Hijri- Sept 2018 in Ajmer Sharif. This entry was posted in Monthly Event and tagged Gyarmee Sharif on Sep 17, 2018 by Syed Bashir Ahmed Niazi. Peer Sahib from Ajmer sharif on UK visit Sept-Oct 2018. Hazrat Haji Peer Bashir Ahmed Chishty, Chief Moallim & Gaddi Nashin (key Holder & Caretaker) of Ajmer Sharif Dargah India,will be in the UK, Insha-Allah from 29th September 2018. Their personal number in the Country will be : 07466352606 . They will be visiting Birmingham, Bradford, . Please contact given number for further details. This entry was posted in International Trips on Sep 16, 2018 by Syed Bashir Ahmed Niazi. Muḥarram is the first month of the Islamic calendar. It is one of the four sacred months of the year. It is held to be the holiest month, . Since the Islamic calendar is a lunar calendar, Muharram moves from year to year when compared with the Gregorian calendar. The tenth day of Muharram is known as the Day of Ashura, part of the Mourning of Muharram. Kingdom Hydrographic Office in Taunton, the next new moon occurs on 2018 September 9 at 18:01 UT/GMT. This entry was posted in Annual Event, URS Sharif on Sep 9, 2018 by Syed Bashir Ahmed Niazi.